This clip shows a short trailer taken from the full length film Valley Films has made of the sanctuary. We hope you enjoy it and, if you want to see more about a typical day at Buttercups, consider buying the DVD from our shop (all proceeds in aid of our goats. For people with severe alcohol and drugs addiction, a stint of goat husbandry might sound like an odd prescription. But that's one approach being tried out by a specialist recovery centre near Maidstone. 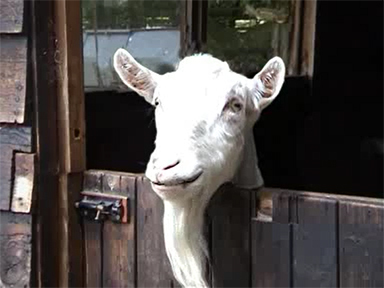 The Kenward Trust, which helps addicts to clean up their lives and get back on track, has formed a partnership with the Buttercups Goat Sanctuary. It's hoped that caring for the animals every day will help to bring structure and a sense of responsibility to the Trust's residents. David Johns explains, talking to Ken Crawford from the Kenward Trust, volunteer Valerie Underdown, and Bob Hitch, founder of Buttercups Goat Sanctuary. This impressive video was part of a project one of our students compeleted for their college.